FM has won the first prize “S.T.A.R. 2008 Award”, an acronym that stands for Development, Technology Applications & Research – assigned in Ancona at the Plastech-Expostampo fair. The awarded project is called “Evolution” (trademark of a product line that will be used in the enamel of ceramic tiles) and will be formally presented to the next Tecnargilla to be held in Rimini from September 29th to October 4th. During the fair, FM will have the pleasure to show the product, revealing all characteristics to its sales network and customers who wish to reserve a trial. The technical committee that awarded this project has justified its assignment, in a real 360° innovation: not only recognizing the validity and technical revolution, but also improvements in logistics management and, not least in reduced environmental impact both in production and in employment. All of this without neglecting the competitiveness of the product only possible thanks to a revolution also in the production compass. 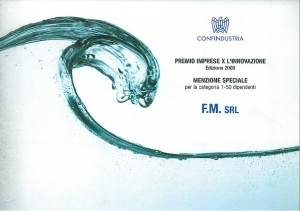 FM is among the innovative companies awarded in the 2009 edition of the Prize “Enterprise for Innovation”, the competition among the most innovative companies in Italy organized for the second consecutive year by Confindustria, in collaboration with the Association Quality Award Italy (Apqi). 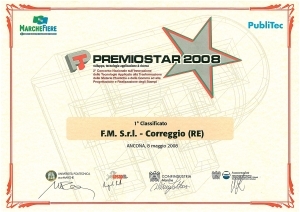 On the basis of the scores reported by companies participating in the various stages of evaluation, the Technical Committee has, in fact, assigned to FM a “Special Mention“, which has been delivered during the official award ceremony held during the VII “Day of Research” that Confindustria has organized November the 6that the Conciliation Auditorium in Rome. The President of the Republic, Giorgio Napolitano, also attended the event, in order to emphasize the great importance of the issue for the country’s development, along with President of Confindustria, Emma Marcegaglia, Vice Presidents for R & I, Diana Bracco and for the South of Italy Cristiana Coppola: senior representatives of government, the world of research and enterprise, international experts. 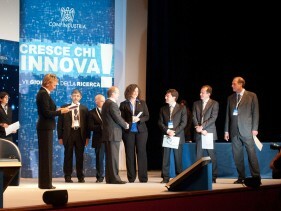 Contributing to the diffusion process of Innovation of the Italian productive system; creating a business culture by providing a framework for excellence in the management of innovative processes; improving business performance through a self-diagnosis instrument that is capable of identifing growth opportunities in its ability of innovation. These are three of the main objectives of “Enterprise for Innovation”. 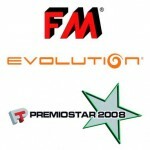 These are three fronts on which FM has managed to stand out once again.